You may even be curious. And then, like many good intentions in life, you haven’t done anything about it. Perhaps you’re not bought into the concept, or you’re just overwhelmed. If not, then click the player embed to the right and you’ll be all caught up. It's about getting your time AND your life back! For those of you already "in the know," despite whatever reason you have for not tracking your time already, keep reading and learn how to get it done TODAY. And I want to make it easy for you. Job performance and metrics set out by your boss (if you have one) is only part of the story. The real performance metric is how we’re doing against how we want to spend our time. 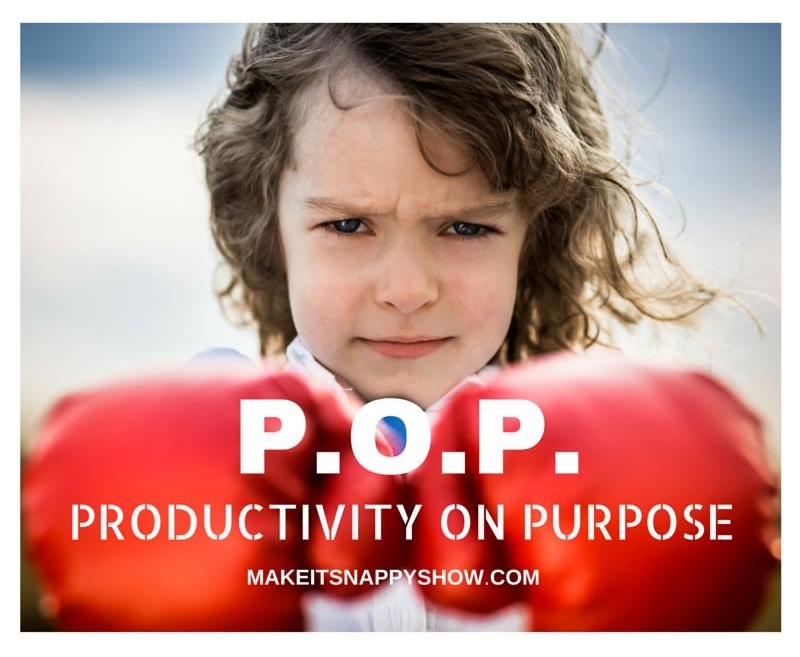 Click here to send your request to join Productivity on Purpose (P.O.P.). If we know our goals for our business, for our lives, we can then setup our tracking system to reflect whether our time is well spent. Understanding how the activities you participate in either contribute to, or take away from (1) your business goals (number of coaching clients per week, widgets sold per quarter, etc.) and (2) your life goals (travel the world, work remotely, etc.) is non-negotiable. If you don’t want to take the time to think about what you’re trying to accomplish, please stop reading right now. Are we spending adequate time on the things that matter? How do we establish metrics for the things that matter? The first step is understanding the value of your time. I have the opportunity, through consulting, to earn considerably greater income than I would burn on a virtual assistant (VA) to do administrative work for me. I didn’t realize this until I spent time thinking about it. After tracking my time, I realized the magnitude of what I was giving up to spend time doing things that weren’t the best use of my time and further, that I didn’t enjoy. The opportunity cost of spending my time on administrative work was excessive! Once I figured this out, outsourcing (i.e., hiring a VA) was a no-brainer. Had I not tracked every moment of my time I would’ve never known the significance of the time I was devoting to administrative work. For you, maybe it’s not administrative work. Maybe it’s time in the grocery store, or time waiting in line at the bank…whatever it is, it’s critical to know what it’s costing you. If it’s a task someone else can do, a task valued at less than you determined your time is worth in Step 1, it’s time to figure out how much time you’re spending on those things. Are you spending a lot of time transcribing phone calls? In contrast, if the task is something only you can do and there’s an opportunity to produce income equivalent to the value of your time, we want to know how much time you’re spending on these items as well. Speaking is a high-value task for me that I'm continuously working on. What is it that only you can do, that will ultimately generate more income than it would cost you to pay someone else to do the task for you? We’re all running our business and working for a reason. Maybe it’s to create more time with our families, or to help feed third-world countries. Whatever your reason, it’s not all about money; it’s about investment. If you’re investing in your personal development, your children, church, or to better your community, it’s a probably a worthwhile investment. When you spend your time on tasks or projects that light you up, then they’re worth your invested time. Are you spending enough time doing these things? How do you know if you’re not tracking your time? If you’re honest, the data will answer this question easily. The more time we spend doing the things in life that matter, the more fulfillment that comes along with it. This is where, as Mike Vardy would say, we put the personal back in personal productivity. How you “bucketize” or “theme” your tasks depends on how you personally want to break down the things you do in life. How much time are you spending on tasks worth your time? How much time are you spending on tasks NOT worth your time? This is really the only reason you to track your time; to develop a baseline and an awareness of what non-value added tasks are costing your business, and ultimately, your life! Once you’re equipped with this information, you can develop strategies to spend more time doing the things that matter! Breaking down tasks into buckets and sub-buckets can be challenging. The level of detail you break your tasks into should be driven off of whether you would be able to use the data you collect to make a decision. Listeners have asked me to provide my personal list of buckets, which I’m glad to do, just not in this blog article. In dedication to my efforts to improve brevity, we'll include my personal "buckets" in next week's article. It’ll do more harm than good (seriously). Yes, even if you’re a “paper person” it’s not worth it. Please save yourself the headaches and the hassle, and track your time electronically. I use ATimeLogger2 because it’s easy, minimally clunky and actually somewhat, dare I say, FUN to use? So ATimeLogger2 is what I’m using for screenshots. You can download the app from iTunes by clicking here. To be completely transparent, the app creators do a better job of explaining how the app works than I even could (I know you’re surprised), so it would be more productive for you to just watch these videos and learn the basics. Here's a great article reviewing Toggl's functionality and the benefits of using it. Click here to check it out. So there you go...how to use the apps. If you currently use, or you’ve stumbled upon other apps you found useful please leave a comment below and let us know what it is and why you like it. The point of time tracking is to understand the results of the work you do. As we discussed in the beginning of this article, results are completely dependent on your goals, your values. The easiest way to know whether you’re spending enough time on a given activity, is whether you’re achieving your desired results. Once you understand how much time it takes to achieve your current results, you can make adjustments on the amount of time it would take to achieve your desired results. The best way to do this is with data you trust. How long does it really take to achieve your desired results? If it’s helpful, here are some example metrics I use to help me know whether I’m spending enough time doing the things in life that matter to me most, and if I’m actually moving the needle forward with my business. For me, it’s incredibly important to work no more than 40 hours per week, preferably less. If I can’t build my business in less than 40 hours per week, I’m not a productive entrepreneur. Worse, I feel like a hypocrite. How can I help parents get their time back if I can’t manage my own? As such, it’s a value I hold very close to me, so I track all the activities I perform related to my business and add them up, week by week. If I’m working more (or less) than 40 hours per week, it’s very easy to see which activities are excessive, and I can then develop strategies to reduce the time I’m spending on said activity. For example, my podcast used to take me over eight hours per week to prep, record, schedule, write, upload, all in. Considering the long-term strategic nature of my podcast, I judged eight hours per week as excessive and developed an outsourcing strategy to bring the hours down to less than four per week. Had I not tracked my data, I would not have known where my opportunities were. Concentrated efforts serving current and potential clients will result in more opportunities to offer clients coaching programs. If I am not serving potential clients regularly, I have less opportunity to offer my coaching services to them and do the work I love. Alternatively, one could measure the number of new subscribers to hours spent on social media. In theory, the more time I spend on social media serving potential clients with productivity content, the more digital product conversions I would see week to week. At what number of hours do I see diminishing returns? It’s impossible for me to know unless I track this data in detail. Low working hours, Increased product conversions and coaching clients ultimately provide a more ideal lifestyle for my family and I as we raise our three children at home. It’s important for me to be a present husband and father. My goals for time tracking allow me to see clearly, how I’m spending the limited moments of my life. This allows me to live deliberately and go after the things that matter most. How do you feel about tracking your own personal time? Please leave a comment below and continue the conversation.